Our main warehouse facilities and trade counter is in Bromborough, Wirral. We have the latest machines and products on display and our staff will only be too happy to assist, advise or take your order. 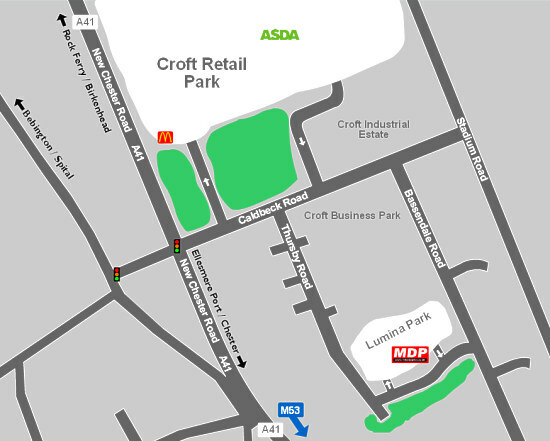 MDP Supplies, 3 Lumina Park, Martindale Road, Bromborough, Wirral, CH62 3PT. To see an area map click here. For driving directions see below. Below there are brief directions. For full detailed driving directions please see the AA Route Planner website. Go through Birkenhead tunnel from Liverpool. After toll booth follow signs for Bromborough / Chester. After approximately 1 mile there is a McDonalds on the left. Take left at junction onto the Croft Retail Park. Stay in right lane and take first right (Thursby Road). Continue to the end of the road and veer left. Turn left immediately onto Lumina Park. Go straight ahead and the showrrom & trade counter is the last unit on the left. Turn right onto the Croft Retail Park. Stay in right lane and take first right (Thursby Road). Continue to the end of the road and veer left. Turn left immediately onto Lumina Park. Go straight ahead and the showrrom & trade counter is the last unit on the left.